Ordtech Pre-Fragmented Bombs are used against the following targets: personnel, non-armoured vehicles, lightly-armoured vehicles, landing craft. Also for close air support against ammunition depots, barracks, communication centres, radar and air defence stations, etc. They require the use of Doppler Proximity Air Burst Fuzes and not ordinary mechanical fuzes. PFB are produced according the same standards of the Mk80 series GP bombs : Dimensions, Aerodynamic Characteristics, Mass, Center of Gravity, Drag and Stability. 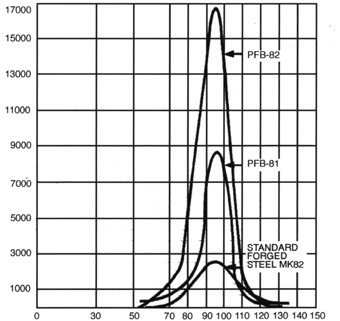 The lethality effect of PFB is 4xfold to 10xfold compared to the corresponding steel bombs of Mk80 series GP. PFB bombs are produced in 250 Lbs and 500 Lbs class as standard (PFB81, PFB82) and under special order in 1000 Lbs class (PFB83). They are equipped with standard conical low drag tails MAU-93 and MAU-94 or can be equipped with high drag retarder tails upon application.